Although rain has eased across the Gold Coast this evening, conditions are expected to deteriorate again during Saturday as a weakening Marcia moves into southeast Queensland. Tropical Cyclone Marcia, which made landfall as a Category 5 cyclone at Shoalwater Bay has left a trail of destruction over Yeppoon and Rockhampton. At time of posting, Marcia has weakened to a category 1 cyclone, and is expected to weaken below cyclone strength tonight. The trough - which is what actually brought the rain to the Gold Coast today - has moved south of the border resulting in the temporary easing of wet conditions across the region this evening. 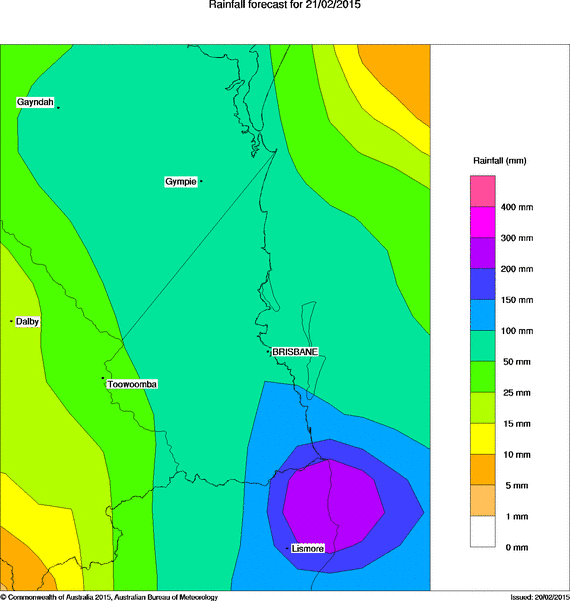 The main rainfall areas at this stage is expected to be near coastal areas again with some possible 24 hour rainfall totals during Saturday in excess of 300mm. Damaging wind gusts may reach around 90 km/hr, mostly near the coast and ranges. The City of Gold Coast Local Disaster Management Group is tracking the progress of the severe weather, and engineers are regularly updating flood modelling based on the latest Bureau of Meteorology data. Modelling shows some minor localised flooding in parts of the city but no threat of major flooding. Little Nerang Dam is the only local dam spilling but this is not expected to cause major impact. Other City dams including Biggera, Loder and Tallebudgera are below emergency trigger levels. 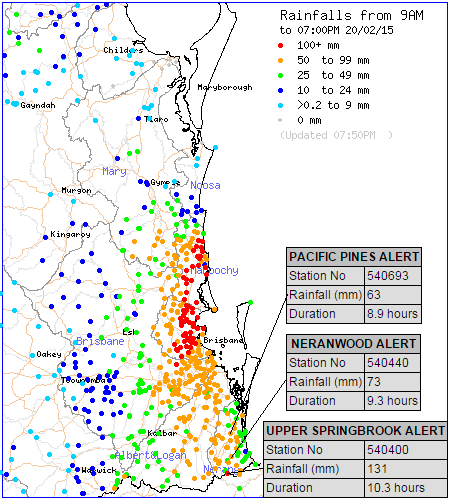 The highest rainfall across the coast so far today (since 9am to 7pm) includes 131mm at Upper Springbrook, 73mm at Neranwood and 63mm at Pacific Pines. Engineers are also closely monitoring the possibility of storm surge. There has been no major erosion or scarping along Gold Coast beaches. A stockpile of sand and heavy equipment is on standby to assist with replenishment if necessary. The SES has received 84 jobs today with 13 completed. Volunteers were providing sandbags from outside the State Emergency Service depot at Southport again today. All Gold Coast beaches are closed and are unlikely to open again until at least Sunday due to continuing dangerous surf conditions. Some facilities including City pools and waste facilities are closed due to safety concerns as a result of the severe weather. For information and assistance about the event, call the City Disaster Hotline on 1800 606 000. Residents needing information on road closures should visit qldalert.com.